National Salad Month strikes again! Today, I’m bringing you a recipe that Paula Deen first brought to fame (Fame? For a recipe? I don’t know…). It uses strawberries, a fruit that is very much in season right now, i.e., tres budget-friendly. It mixes salty with sweet — one of my favorite flavor combinations (like peanut butter and apples and sea salt and chocolate). It’s misuse of the word “salad” makes me giggle. 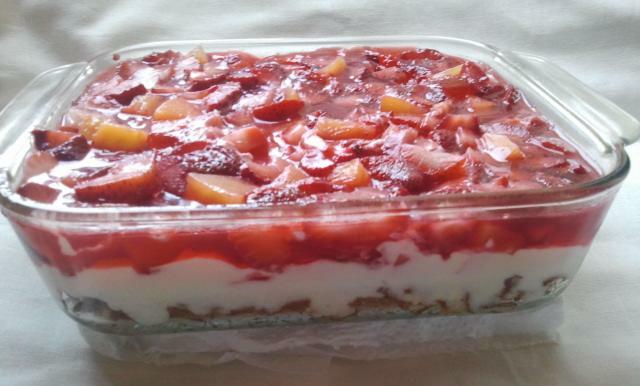 Really, it’s more of a layered dessert… A dessert casserole of sorts. But this should come as no surprise since Paula Deen is the one who named the dish. And since it’s a Paula Deen recipe, I’m sure it will come as no surprise to you that it has more butter and sugar than necessary. In fact, I was able to cut the butter and sugar in HALF as well as the whipped topping… and I didn’t notice their absence! Combine the melted butter, broken pretzels, and 2 T of sugar until pretzels are coated. Spread it evenly over the bottom of a greased casserole dish and bake in oven for about 8-10 minutes or until hardened. Allow to cool. After the cream cheese has softened, whisk together with 1/2 c. of sugar then fold in whipped topping until incorporated. Spread the mixture over the pretzel crust and refrigerate for about 30 minutes. 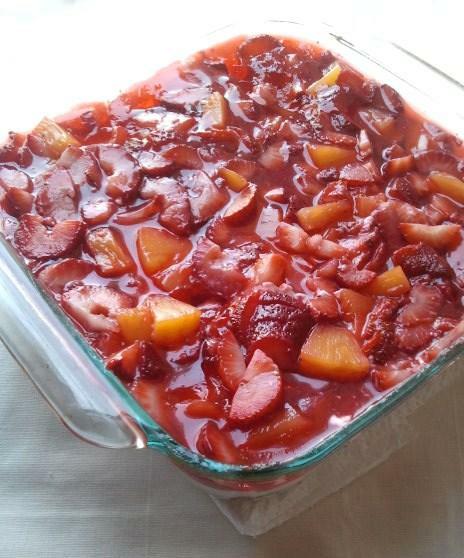 Combine the strawberries and pineapples and spread over the mixture and crust. In a small bowl, dissolve the gelatin packet in boiling water and set aside until cool. Pour over the top of the fruit. Refrigerate for about four hours, or until gelatin has set. Enjoy!